Rush Orders: these have an eight minute timer and require you to make six items. They pay fuel costs, a small cash reward, status, and 300 faction points with your city's Tradeskill Society. They also give tradeskill experience. Work Orders: these are not timed and require you to make twelve items. They pay fuel costs, a small cash reward, status, and 200 faction points with your city's Tradeskill Society. They also give tradeskill experience. Walk into any Tradeskill Instance or the open-air tradeskill area in your city and you will see two NPC's, tagged Work Orders and Rush Orders. Speak to one of them to obtain permission for a Writ. Tradeskill Writ NPC's in a Qeynos tradeskill instance. With GU60 writs start at level 15 with one untimed work order. The rush order option kicks in at level 20 you'll see several options (Writs start at level 20 so a level 20 Artisan only has one option). These are listed by level of difficulty relative to your level, the one at the top being the toughest. The hardest writs of each Tier may ask you to make more than one recipe. Next find a Work Order Table or Clipboard to obtain the actual Writ. 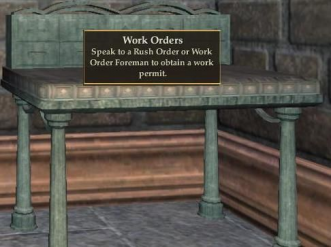 In Qeynos there is one work order table at the top of the stairs near the Work Order NPC and one downstairs past the Loom on the way to the Forge Room. In Freeport there is one table at the top of the instance, and another on the bottom floor across from the Broker and near the Forge. Note carefully: Rush Order timers start when you pick up the writ at the table. Work Order Clipboards are usually placed fairly conveniently around open-air crafting areas. As of GU60 Tier 8 and Tier 9 have new writs every two levels, offered at x1, x3, x5, x7, and x9. Craft the items. All items are common recipes available in Essentials books. The items you're making for the writ never show up in your inventory, so don't waste time checking. All combines must be the best possible quality to count. Fuel reimbursement for consumables are calculated according to the lowest possible number of combines, so go for that fourth bar of progress. You will be paid fuel costs as you complete each step of the writ, so watch for the quest reward window. If you are on a Rush Order and fail when the timer runs out, you will need to return to the Work Order Table to get a new order. You will not receive fuel reimbursement for steps not completed before the timer ran out. The timer stops when you finish the last item on the writ, so don't kill yourself getting back up the stairs to turn it in. When you have finished the Writ return to the NPC you started with for the cash reward, status, and faction. Status rewards scale with your level the same way Adventure Writs do. There is no longer a lockout timer on Tradeskill writs so you can grab another immediately if you like. Tradeskill writs give tradeskill XP upon completion, making them handy for grinding out levels. However, if you have turned off quest experience (right-click your experience bar) you will NOT get any XP for these. Before picking up your invoice, check for sufficient fuel and raws. It's also handy to have your recipe book open and scrolled to the recipe range you're working in. You can actually get a good bit away from the Work Order Table before the window closes. Get as far away as you can before accepting the invoice for a couple of extra seconds. Use your recipe book Search function. You do not have to type the whole name; for example, typing Adamantine will bring up every Adamantine item you can make, arrow will bring up every arrow you can make. Partial words work too, like dag for dagger. Fuel cost reimbursement for these writs is calculated by the cost of fuel in Freeport and Qeynos. Buying in exile or in Maj'Dul will inflate your fuel costs and you will not be reimbursed for the extra cost. Keep extra raws in your broker slots for easy access in a hurry! As you work through writs, arrange your screen to minimize mouse movement. Put the "Accept" reward popup near your "Begin" crafting button. Lost seconds mater. On multi-part writs, watch for the fuel reimbursement quest reward window. This is your hint to change recipes. If you have equipment which increases your Artisan skill, use it. The Choosing a Profession Artisan's vest and Fallen Dynasty Tradeskill quest rewards are popular, and there are other goodies which drop in Norrath to help. Use whatever power conservation techniques you have available. Even the most skillful crafter will burn a good bit of power trying to beat the clock. For power conservation strategies, please read our Tradeskill Arts Guide. If you have to quit a Rush Order for any reason, complete the step you are on so you at least receive fuel reimbursement. Work through the larger multi-batches of a writ first. Since failed writs cause you to lose any reimbursements in process, finishing a "make 3" step early as opposed to late minimizes the amount of loss you stand to face. Better still, if you can save a "make 1" for the last combine, even if you fail you get an item to sell back. Tradeskill Writs are deletable, but wait for your timer to run out if you want to delete one you are actually working on. There have been issues reported with the timer not resetting under those circumstances. Items which count for a writ made while the timer is running do not drop into inventory; however, items that do not count toward the writ or made after the timer expires do, so be sure to sell off those odds and ends. The way the provisioner work orders operate now is intentional. It was not within the scope of the work orders to change the existing tradeskill recipes. The provisioner work orders were modified to pay back 'exact' fuel for each step, the additional components are not considered fuel and are not on every recipe. TSO Crafting Writs are available on the Isle of Mara and give Far Seas Supply Division faction instead of city faction. They work just like the city tradeskill writs. Both the Rush Order and Work Order desks are in the same room as Kaisha. Tradeskill writs up to level 90 are offered by the usual suspects - ie, the normal writ-givers in your home town or guild hall. The main change to the writs is that they are offered at different levels than they have been previously. Instead of continuing the same pattern after 70, 74, and 79, they will be offered at 81, 83, 85, 87, and 89. This should leave less of a level gap between quests as you work your way up. 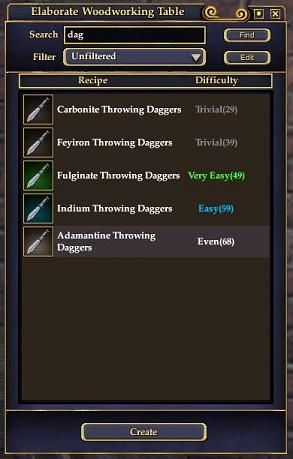 As of February 1, 2014, these have not yet been added to the game. Parts of this page were originally written by Calthine. This page last modified 2014-02-17 18:54:41.